Communications using a radio taken into the great outdoors. On Sunday, May 6th, 2018 I rode my bicycle to a construction site with a good location for working portable. I set up my SOTABEAMS dipole and used my YouKits HB1B Mk III to make some contacts. The New England QSO Party event was being held that weekend and I worked 6 stations in a fairly short time. It seemed like the sidetone of my HB1B devolved into lots of clicks and very little tone after a while. Not sure why but it was annoying. A great day for ham radio! I made a couple of FT8 contacts from here in St. John. I captured them for a video and then realized I probably needed to make a video about how to get started with FT8! So, this video shows you how simple it is to configure and use the WSJT-X software to do FT8. 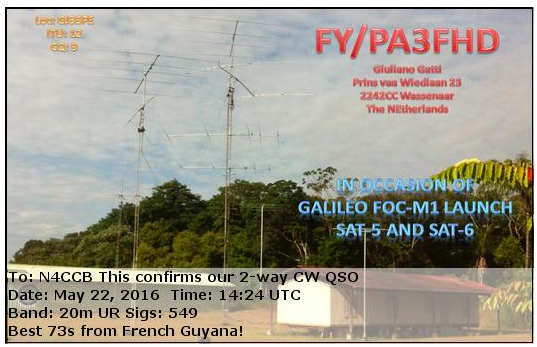 I follow that up with some screen captures of contacts with Greece and France from my temporary vacation QTH here on the island. TN to Finland with Only 100 milliwatts! Outdoors at a public park, I used a KX3 set to 1/10th of a watt… 100 milliwatts… to work a station in Finland. They were loud to me so I had a feeling I’d be able to get through. Now, this is a SuperStation in Finland with great antennas. My signal was ultra-weak but the QSO is in the logbook!